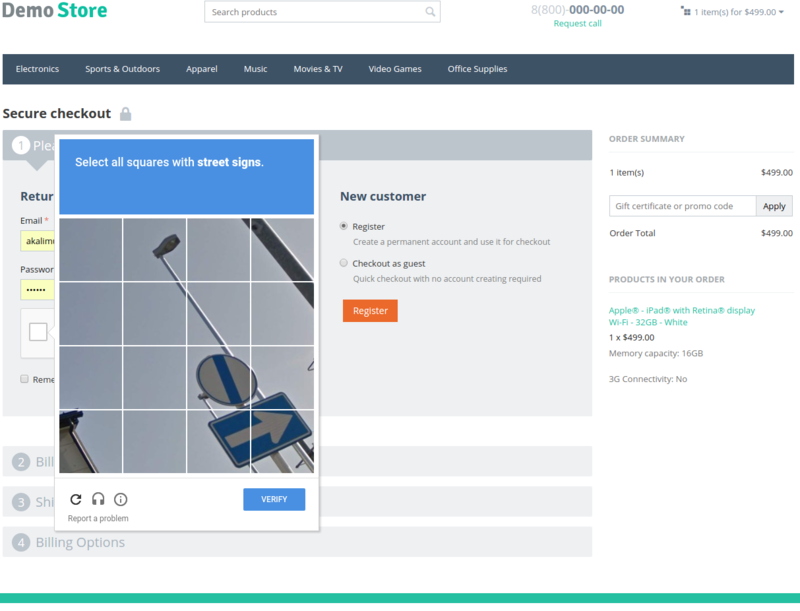 I am glad to inform you that we have developed the reCAPTCHA 2.0 add-on that protects your website from spam, bots, and fake user accounts. - Participation in development of artificial intelligence technologies. Google analyzes how people solve reCAPTCHAs and uses this information for further development of the artificial intelligence. Is it possible to implement this into version 4.0.3? Yes, we will adapt the add-on for you. I will let you know when the add-on is ready. We have adapted the add-on for CS-Cart 4.0.3. Please, download the v4.0.3.1 archive. Can you be so kind to adapt it to 4.3.5, please? The add-on is compatible with CS-Cart 4.3.5. Please, download the v4.3.0.3 archive. Thanks! Got it. Works great. I am glad to hear that! Thank you. Is this supported in 4.4.2? Site only shows downloads for 4.3.x and other older versions. Yes, the add-on is compatible with CS-Cart 4.4.2. Please, download the v.4.4.0.3 archive. I been having alot of false sign ups on accounts and mmostly mail.ru accts i did have the old style captcha i just uploaDED this version 2 and installed it but getting the key etc it says ste p1 and then step 2 something about me pasting some code in the template with this addon did it automatically place that code ? I see this is available as standard with cs-cart on the latest update which is great however I configured, removed cache folder and done the admin cc but its still showing the normal cs-cart one and not the google ReCaptcha? any ideas? Does this addon also change the ReCaptcha for the Comments and Reviews section and product Reviews? We are using CS-Cart 4.3.4. What version of the addon should I download? You need to register your domain with google and then enter the keys in the addon settings. I can look into the issue if you send me PM with the FTP access to your store. Yes, you can configure the necessary forms on the Settings/Image verification page as for usual captcha. You need to download the v4.3.0.4 archive. Excellent addon. Easy to install and configure. Took less than 5 minutes for the whole thing. David, thank you for your kind words!